Cabs can be made to order with hole placement specified by customer. A drawing showing placement of hole is required. Please allow extra time for special orders. See the order form for hole placement diagram. Discounts available on larger orders - please enquire! 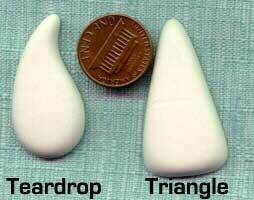 Teardrops & Triangles -- can be painted or decaled; made into earrings or necklaces.